$1500 deposit. 48 monthly repayments of $380. $1500 deposit. 48 monthly repayments of $391. $1500 deposit. 48 monthly repayments of $416. $1500 deposit. 48 monthly repayments of $426. $1500 deposit. 48 monthly repayments of $406. $1500 deposit. 48 monthly repayments of $442. [^A]Comparison Rates will vary for each customer between 6.07% and up to 16.12% (and annual percentage rates between 3.76% to 13.62%) depending primarily on your credit score and other relevant criteria determined by Toyota Finance. Comparison rates of 8.70% are available to around 70% of potential customers with a credit score of 600 and above, who also satisfy other relevant criteria determined by Toyota Finance. These figures are based on modelling by Toyota Finance. [†A] $102 per week are available to approved personal applicants of Toyota Finance to finance the purchase of a Toyota Yaris Ascent Hatch Automatic with Toyota Safety Sense (Ink and Black (Fabric)) Automatic, 1.3L Petrol . Driveaway price of $18590 (includes 12 months registration, 12 months compulsory third party insurance, dealer delivery and stamp duty), less a deposit of $1500, with 48 monthly payments in arrears not exceeding $442. Based on an annual percentage rate of 6.35 %. Total amount payable $21216. Terms, conditions, fees and charges apply. Offer valid until 26/04/2019. Comparison Rate of 8.70% is based on a 5 year secured consumer fixed rate loan of $30,000. WARNING: This comparison rate is true only for the examples given and may not include all fees and charges. Different terms, fees or other loan amounts might result in a different comparison rate. Toyota Finance is a division of Toyota Finance Australia Limited ABN 48 002 435 181, AFSL and Australian Credit Licence 392536. [^B]Comparison Rates will vary for each customer between 6.07% and up to 16.12% (and annual percentage rates between 3.76% to 13.62%) depending primarily on your credit score and other relevant criteria determined by Toyota Finance. Comparison rates of 8.70% are available to around 70% of potential customers with a credit score of 600 and above, who also satisfy other relevant criteria determined by Toyota Finance. These figures are based on modelling by Toyota Finance. 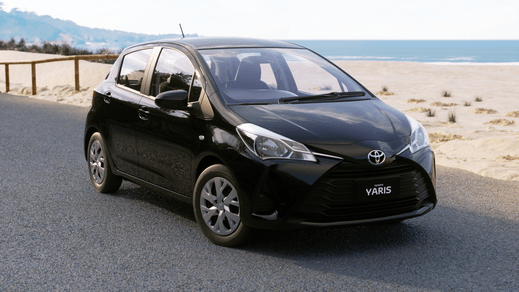 [†B] $99 per week are available to approved personal applicants of Toyota Finance to finance the purchase of a Toyota Yaris Ascent Hatch Automatic (Ink and Black (Fabric)) Automatic, 1.3L Petrol . Driveaway price of $17940 (includes 12 months registration, 12 months compulsory third party insurance, dealer delivery and stamp duty), less a deposit of $1500, with 48 monthly payments in arrears not exceeding $426. Based on an annual percentage rate of 6.35 %. Total amount payable $20448. Terms, conditions, fees and charges apply. Offer valid until 26/04/2019. Comparison Rate of 8.70% is based on a 5 year secured consumer fixed rate loan of $30,000. WARNING: This comparison rate is true only for the examples given and may not include all fees and charges. Different terms, fees or other loan amounts might result in a different comparison rate. Toyota Finance is a division of Toyota Finance Australia Limited ABN 48 002 435 181, AFSL and Australian Credit Licence 392536. [^C]Comparison Rates will vary for each customer between 6.07% and up to 16.12% (and annual percentage rates between 3.76% to 13.62%) depending primarily on your credit score and other relevant criteria determined by Toyota Finance. Comparison rates of 8.70% are available to around 70% of potential customers with a credit score of 600 and above, who also satisfy other relevant criteria determined by Toyota Finance. These figures are based on modelling by Toyota Finance. 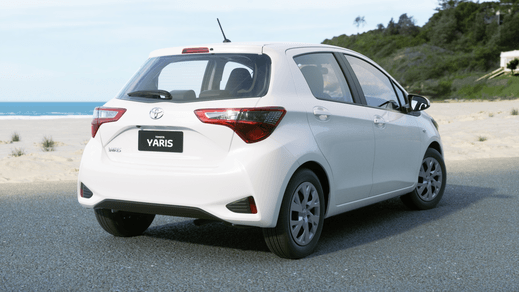 [†C] $94 per week are available to approved personal applicants of Toyota Finance to finance the purchase of a Toyota Yaris Ascent Hatch Manual with Toyota Safety Sense (Crystal Pearl and Black (Fabric)) Manual, 1.3L Petrol . Driveaway price of $17090 (includes 12 months registration, 12 months compulsory third party insurance, dealer delivery and stamp duty), less a deposit of $1500, with 48 monthly payments in arrears not exceeding $406. Based on an annual percentage rate of 6.35 %. Total amount payable $19488. Terms, conditions, fees and charges apply. Offer valid until 26/04/2019. Comparison Rate of 8.70% is based on a 5 year secured consumer fixed rate loan of $30,000. WARNING: This comparison rate is true only for the examples given and may not include all fees and charges. Different terms, fees or other loan amounts might result in a different comparison rate. Toyota Finance is a division of Toyota Finance Australia Limited ABN 48 002 435 181, AFSL and Australian Credit Licence 392536. [^D]Comparison Rates will vary for each customer between 6.07% and up to 16.12% (and annual percentage rates between 3.76% to 13.62%) depending primarily on your credit score and other relevant criteria determined by Toyota Finance. Comparison rates of 8.70% are available to around 70% of potential customers with a credit score of 600 and above, who also satisfy other relevant criteria determined by Toyota Finance. These figures are based on modelling by Toyota Finance. [†D] $91 per week are available to approved personal applicants of Toyota Finance to finance the purchase of a Toyota Yaris Ascent Hatch Manual (Crystal Pearl and Black (Fabric)) Manual, 1.3L Petrol . Driveaway price of $16440 (includes 12 months registration, 12 months compulsory third party insurance, dealer delivery and stamp duty), less a deposit of $1500, with 48 monthly payments in arrears not exceeding $391. Based on an annual percentage rate of 6.35 %. Total amount payable $18768. Terms, conditions, fees and charges apply. Offer valid until 26/04/2019. Comparison Rate of 8.70% is based on a 5 year secured consumer fixed rate loan of $30,000. WARNING: This comparison rate is true only for the examples given and may not include all fees and charges. Different terms, fees or other loan amounts might result in a different comparison rate. Toyota Finance is a division of Toyota Finance Australia Limited ABN 48 002 435 181, AFSL and Australian Credit Licence 392536. [^E]Comparison Rates will vary for each customer between 6.07% and up to 16.12% (and annual percentage rates between 3.76% to 13.62%) depending primarily on your credit score and other relevant criteria determined by Toyota Finance. Comparison rates of 8.70% are available to around 70% of potential customers with a credit score of 600 and above, who also satisfy other relevant criteria determined by Toyota Finance. These figures are based on modelling by Toyota Finance. 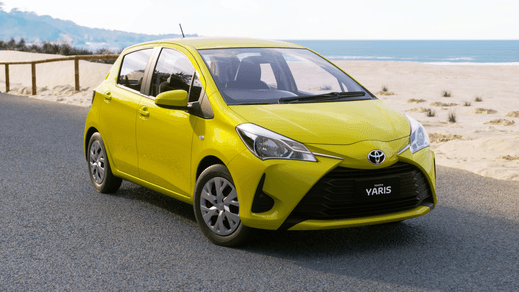 [†E] $88 per week are available to approved personal applicants of Toyota Finance to finance the purchase of a Toyota Yaris Ascent Hatch Manual (Vivid Yellow and Black (Fabric)) Manual, 1.3L Petrol . Driveaway price of $15990 (includes 12 months registration, 12 months compulsory third party insurance, dealer delivery and stamp duty), less a deposit of $1500, with 48 monthly payments in arrears not exceeding $380. Based on an annual percentage rate of 6.35 %. Total amount payable $18240. Terms, conditions, fees and charges apply. Offer valid until 26/04/2019. Comparison Rate of 8.70% is based on a 5 year secured consumer fixed rate loan of $30,000. WARNING: This comparison rate is true only for the examples given and may not include all fees and charges. Different terms, fees or other loan amounts might result in a different comparison rate. Toyota Finance is a division of Toyota Finance Australia Limited ABN 48 002 435 181, AFSL and Australian Credit Licence 392536. [^F]Comparison Rates will vary for each customer between 6.07% and up to 16.12% (and annual percentage rates between 3.76% to 13.62%) depending primarily on your credit score and other relevant criteria determined by Toyota Finance. Comparison rates of 8.70% are available to around 70% of potential customers with a credit score of 600 and above, who also satisfy other relevant criteria determined by Toyota Finance. These figures are based on modelling by Toyota Finance. 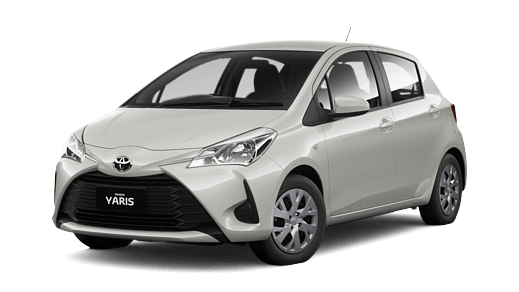 [†F] $91 per week are available to approved personal applicants of Toyota Finance to finance the purchase of a Toyota Yaris Ascent Hatch Manual (Crystal Pearl and Black (Fabric)) Manual, 1.3L Petrol . Driveaway price of $16440 (includes 12 months registration, 12 months compulsory third party insurance, dealer delivery and stamp duty), less a deposit of $1500, with 48 monthly payments in arrears not exceeding $391. Based on an annual percentage rate of 6.35 %. Total amount payable $18768. Terms, conditions, fees and charges apply. Offer valid until 26/04/2019. Comparison Rate of 8.70% is based on a 5 year secured consumer fixed rate loan of $30,000. WARNING: This comparison rate is true only for the examples given and may not include all fees and charges. Different terms, fees or other loan amounts might result in a different comparison rate. Toyota Finance is a division of Toyota Finance Australia Limited ABN 48 002 435 181, AFSL and Australian Credit Licence 392536. [^G]Comparison Rates will vary for each customer between 6.07% and up to 16.12% (and annual percentage rates between 3.76% to 13.62%) depending primarily on your credit score and other relevant criteria determined by Toyota Finance. Comparison rates of 8.70% are available to around 70% of potential customers with a credit score of 600 and above, who also satisfy other relevant criteria determined by Toyota Finance. These figures are based on modelling by Toyota Finance. [†G] $96 per week are available to approved personal applicants of Toyota Finance to finance the purchase of a Toyota Yaris Ascent Hatch Automatic (Cherry and Black (Fabric)) Automatic, 1.3L Petrol . Driveaway price of $17490 (includes 12 months registration, 12 months compulsory third party insurance, dealer delivery and stamp duty), less a deposit of $1500, with 48 monthly payments in arrears not exceeding $416. Based on an annual percentage rate of 6.35 %. Total amount payable $19968. Terms, conditions, fees and charges apply. Offer valid until 26/04/2019. Comparison Rate of 8.70% is based on a 5 year secured consumer fixed rate loan of $30,000. WARNING: This comparison rate is true only for the examples given and may not include all fees and charges. Different terms, fees or other loan amounts might result in a different comparison rate. Toyota Finance is a division of Toyota Finance Australia Limited ABN 48 002 435 181, AFSL and Australian Credit Licence 392536. [^H]Comparison Rates will vary for each customer between 6.07% and up to 16.12% (and annual percentage rates between 3.76% to 13.62%) depending primarily on your credit score and other relevant criteria determined by Toyota Finance. Comparison rates of 8.70% are available to around 70% of potential customers with a credit score of 600 and above, who also satisfy other relevant criteria determined by Toyota Finance. These figures are based on modelling by Toyota Finance. 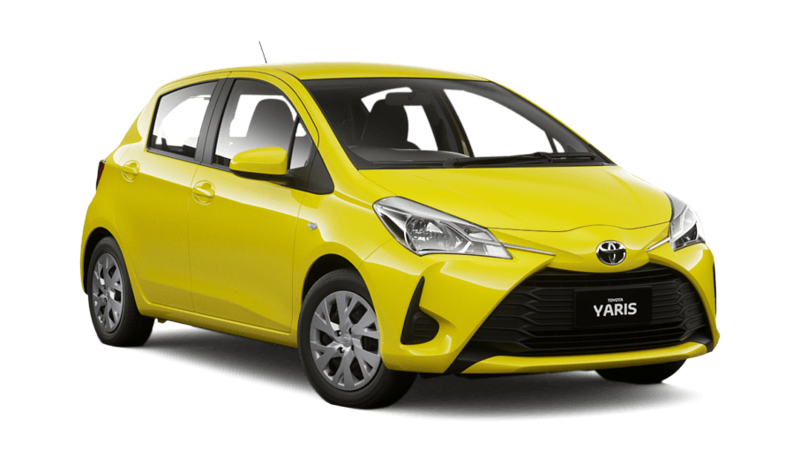 [†H] $96 per week are available to approved personal applicants of Toyota Finance to finance the purchase of a Toyota Yaris Ascent Hatch Automatic (Vivid Yellow and Black (Fabric)) Automatic, 1.3L Petrol . Driveaway price of $17490 (includes 12 months registration, 12 months compulsory third party insurance, dealer delivery and stamp duty), less a deposit of $1500, with 48 monthly payments in arrears not exceeding $416. Based on an annual percentage rate of 6.35 %. Total amount payable $19968. Terms, conditions, fees and charges apply. Offer valid until 26/04/2019. Comparison Rate of 8.70% is based on a 5 year secured consumer fixed rate loan of $30,000. WARNING: This comparison rate is true only for the examples given and may not include all fees and charges. Different terms, fees or other loan amounts might result in a different comparison rate. Toyota Finance is a division of Toyota Finance Australia Limited ABN 48 002 435 181, AFSL and Australian Credit Licence 392536. [^I]Comparison Rates will vary for each customer between 6.07% and up to 16.12% (and annual percentage rates between 3.76% to 13.62%) depending primarily on your credit score and other relevant criteria determined by Toyota Finance. Comparison rates of 8.70% are available to around 70% of potential customers with a credit score of 600 and above, who also satisfy other relevant criteria determined by Toyota Finance. These figures are based on modelling by Toyota Finance. 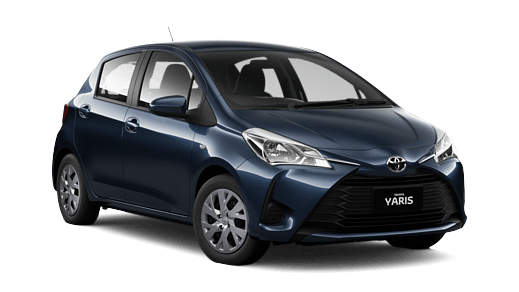 [†I] $99 per week are available to approved personal applicants of Toyota Finance to finance the purchase of a Toyota Yaris Ascent Hatch Automatic (Dynamic Blue and Black (Fabric)) Automatic, 1.3L Petrol . Driveaway price of $17940 (includes 12 months registration, 12 months compulsory third party insurance, dealer delivery and stamp duty), less a deposit of $1500, with 48 monthly payments in arrears not exceeding $426. Based on an annual percentage rate of 6.35 %. Total amount payable $20448. Terms, conditions, fees and charges apply. Offer valid until 26/04/2019. Comparison Rate of 8.70% is based on a 5 year secured consumer fixed rate loan of $30,000. WARNING: This comparison rate is true only for the examples given and may not include all fees and charges. Different terms, fees or other loan amounts might result in a different comparison rate. Toyota Finance is a division of Toyota Finance Australia Limited ABN 48 002 435 181, AFSL and Australian Credit Licence 392536. [^J]Comparison Rates will vary for each customer between 6.07% and up to 16.12% (and annual percentage rates between 3.76% to 13.62%) depending primarily on your credit score and other relevant criteria determined by Toyota Finance. Comparison rates of 8.70% are available to around 70% of potential customers with a credit score of 600 and above, who also satisfy other relevant criteria determined by Toyota Finance. These figures are based on modelling by Toyota Finance. [†J] $99 per week are available to approved personal applicants of Toyota Finance to finance the purchase of a Toyota Yaris Ascent Hatch Automatic (Inferno and Black (Fabric)) Automatic, 1.3L Petrol . Driveaway price of $17940 (includes 12 months registration, 12 months compulsory third party insurance, dealer delivery and stamp duty), less a deposit of $1500, with 48 monthly payments in arrears not exceeding $426. Based on an annual percentage rate of 6.35 %. Total amount payable $20448. Terms, conditions, fees and charges apply. Offer valid until 26/04/2019. Comparison Rate of 8.70% is based on a 5 year secured consumer fixed rate loan of $30,000. WARNING: This comparison rate is true only for the examples given and may not include all fees and charges. Different terms, fees or other loan amounts might result in a different comparison rate. Toyota Finance is a division of Toyota Finance Australia Limited ABN 48 002 435 181, AFSL and Australian Credit Licence 392536. [^K]Comparison Rates will vary for each customer between 6.07% and up to 16.12% (and annual percentage rates between 3.76% to 13.62%) depending primarily on your credit score and other relevant criteria determined by Toyota Finance. Comparison rates of 8.70% are available to around 70% of potential customers with a credit score of 600 and above, who also satisfy other relevant criteria determined by Toyota Finance. These figures are based on modelling by Toyota Finance. [†K] $88 per week are available to approved personal applicants of Toyota Finance to finance the purchase of a Toyota Yaris Ascent Hatch Manual (Cherry and Black (Fabric)) Manual, 1.3L Petrol . Driveaway price of $15990 (includes 12 months registration, 12 months compulsory third party insurance, dealer delivery and stamp duty), less a deposit of $1500, with 48 monthly payments in arrears not exceeding $380. Based on an annual percentage rate of 6.35 %. Total amount payable $18240. Terms, conditions, fees and charges apply. Offer valid until 26/04/2019. Comparison Rate of 8.70% is based on a 5 year secured consumer fixed rate loan of $30,000. WARNING: This comparison rate is true only for the examples given and may not include all fees and charges. Different terms, fees or other loan amounts might result in a different comparison rate. Toyota Finance is a division of Toyota Finance Australia Limited ABN 48 002 435 181, AFSL and Australian Credit Licence 392536. [^L]Comparison Rates will vary for each customer between 6.07% and up to 16.12% (and annual percentage rates between 3.76% to 13.62%) depending primarily on your credit score and other relevant criteria determined by Toyota Finance. Comparison rates of 8.70% are available to around 70% of potential customers with a credit score of 600 and above, who also satisfy other relevant criteria determined by Toyota Finance. These figures are based on modelling by Toyota Finance. [†L] $91 per week are available to approved personal applicants of Toyota Finance to finance the purchase of a Toyota Yaris Ascent Hatch Manual (Dynamic Blue and Black (Fabric)) Manual, 1.3L Petrol . Driveaway price of $16440 (includes 12 months registration, 12 months compulsory third party insurance, dealer delivery and stamp duty), less a deposit of $1500, with 48 monthly payments in arrears not exceeding $391. Based on an annual percentage rate of 6.35 %. Total amount payable $18768. Terms, conditions, fees and charges apply. Offer valid until 26/04/2019. Comparison Rate of 8.70% is based on a 5 year secured consumer fixed rate loan of $30,000. WARNING: This comparison rate is true only for the examples given and may not include all fees and charges. Different terms, fees or other loan amounts might result in a different comparison rate. Toyota Finance is a division of Toyota Finance Australia Limited ABN 48 002 435 181, AFSL and Australian Credit Licence 392536. [^M]Comparison Rates will vary for each customer between 6.07% and up to 16.12% (and annual percentage rates between 3.76% to 13.62%) depending primarily on your credit score and other relevant criteria determined by Toyota Finance. Comparison rates of 8.70% are available to around 70% of potential customers with a credit score of 600 and above, who also satisfy other relevant criteria determined by Toyota Finance. These figures are based on modelling by Toyota Finance. 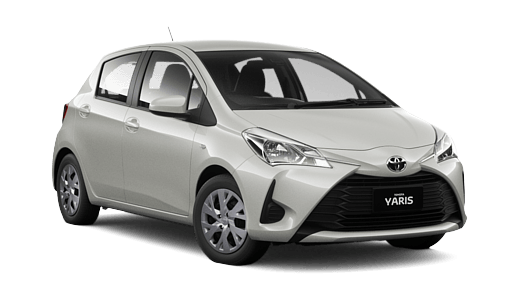 [†M] $99 per week are available to approved personal applicants of Toyota Finance to finance the purchase of a Toyota Yaris Ascent Hatch Automatic (Graphite and Black (Fabric)) Automatic, 1.3L Petrol . Driveaway price of $17940 (includes 12 months registration, 12 months compulsory third party insurance, dealer delivery and stamp duty), less a deposit of $1500, with 48 monthly payments in arrears not exceeding $426. Based on an annual percentage rate of 6.35 %. Total amount payable $20448. Terms, conditions, fees and charges apply. Offer valid until 26/04/2019. Comparison Rate of 8.70% is based on a 5 year secured consumer fixed rate loan of $30,000. WARNING: This comparison rate is true only for the examples given and may not include all fees and charges. Different terms, fees or other loan amounts might result in a different comparison rate. Toyota Finance is a division of Toyota Finance Australia Limited ABN 48 002 435 181, AFSL and Australian Credit Licence 392536.